Mayor Walsh’s housing plan envisions increasing the amount of City-controlled affordable housing resources by $20M annually. Legislative modification to the current Linkage Program was one general suggestion offered. Also being discussed is change to the City’s Inclusionary Development Program (IDP). Any modification to the Linkage or IDP programs should be part of a more comprehensive plan to support affordable and middle income housing and should not be addressed separately. Established in 1983 and enacted into law in 1987, the City’s Linkage Program provides funds for both affordable housing and job training. The linkage payments are made by large-scale commercial developers who are required to pay exactions to the City for projects that require zoning approval. Linkage payments are split into two funds – the Neighborhood Housing Trust (NHT) and Neighborhood Jobs Trust (NJT). Developers are currently required to pay linkage fees totaling $10.01 per square foot after the first 100,000 square feet, with $8.34 per square foot designated for housing and $1.67 for job training. Developers make linkage payments in seven (7) equal annual installments or they can create housing in an amount equal to the cash requirement. 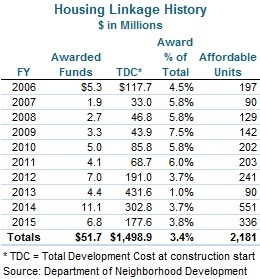 Over the last ten years (FY06 to FY15), the Linkage Program has generated over $51M for affordable housing which contributed to the creation of 2,181 new affordable units. Typically, linkage funds cover a small portion of a project’s total development costs. In addition, linkage funds assisted projects that preserved 1,670 affordable units and created 240 new market rate units. The NHT approves linkage funds for worthy projects submitted by developers and community development groups. Over the 10 years, the neighborhoods of Roxbury, Dorchester, and Jamaica Plain received the largest shares of linkage awards. The Linkage Program allows for fee increases to be made every three years based on the change in a combined Consumer Price Index over that period. The last increase occurred in October 2013 and prior to that in 2006. The next fee increase cannot occur until November 2016 which would require a recommendation made by the BRA and approval by the Zoning Commission.